Standard Features • Contemporary styling places maximum attention on merchandising. All HGL merchandisers have the same access panel design for commonality between merchandisers. • Product visibility is improved with 60” long vertical T-8 lighting and electronic ballasts. Merchandise is evenly illuminated throughout display area. More lights per merchandiser with two lights in single-door, three-lights in two-door, and four lights in three-door models. • White powder coated exterior and interior finish. • CFC-Free foamed-in-place urethane insulation. • Doors can be locked open for stocking. 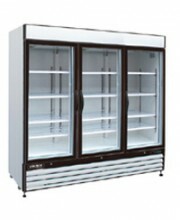 • Each door section includes four adjustable cantilever-type shelves and a bottom rack. All shelves and racks have a white epoxy coated finish. 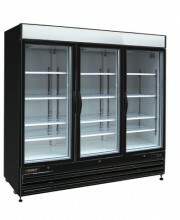 Shelves may be slanted for special displays and are interchangeable in all models. • Full use of the shelf upright posts is available for positioning the shelves. Shelf bracket profiles have been slimmed down to better facilitate product merchandising under and across the shelves. • Low temperature HGL models are equipped with a single 230 volt power cord attached (see diagram). 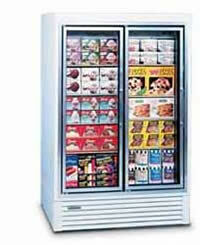 • Balanced refrigeration system provides maximum efficiency and energy savings.